This yoga mat is quite different from others I have tried. Although made of microfibre, it is definitely a mat rather than a towel and relatively heavy due to the rubbery knobs dotting the underside. While the dots give very good grip and stability on the ground, they can be felt through the fabric. The top surface has a silky texture that feels luxurious and nice to lie on. I have the one called “Rainbow” I love the colours blending into one another, the effect is quite gorgeous. The size is generous (72” x 62” or 183 x 62 cm) and easily covers my standard foam mats with a little overlap. 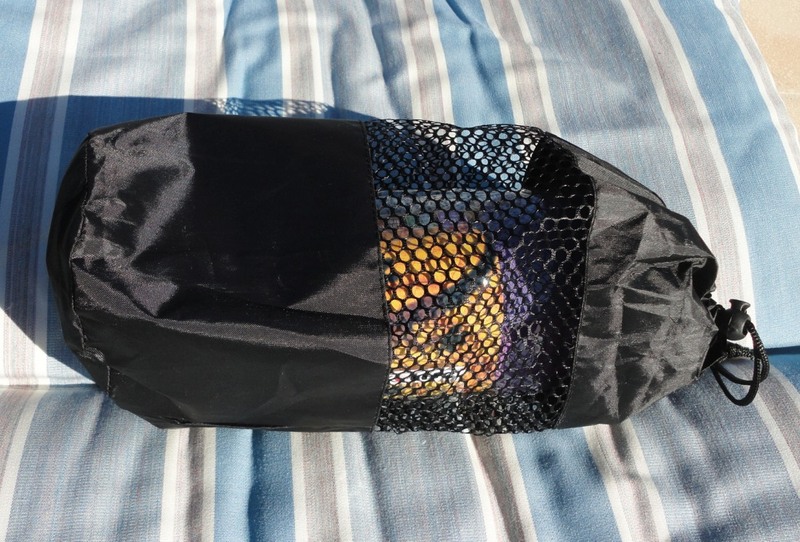 It comes complete with a fairly large nylon and mesh carrying bag closed by a drawstring. The rolled-up mat fits comfortably inside however loosely you fold it. The overlock stitching around the edges looks thick and solid, and manufacture is very good (no loose threads that I could see). Washing temperature is very important. Cold or warm water only, no more than 30 degrees C. Wash by itself the first time. 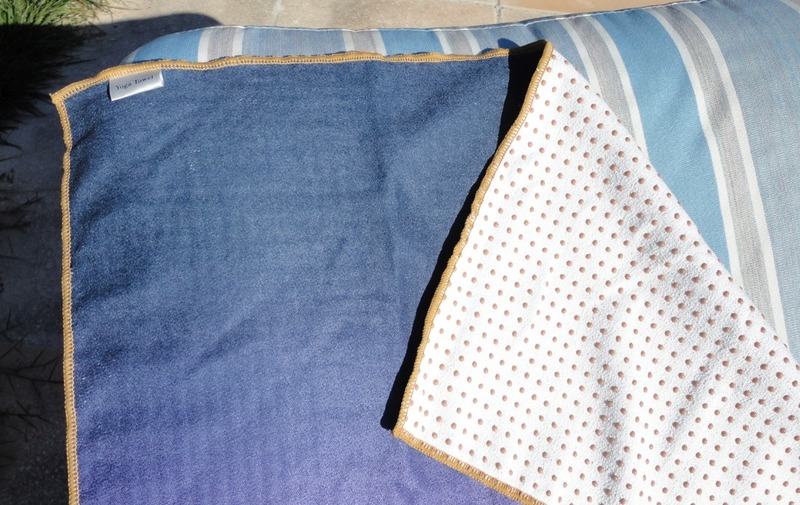 Use as little mild detergent as possible, especially if the mat is not really oily or dirty. The thing with Microfibre is to keep the air spaces open and avoid anything that could cause clogging. 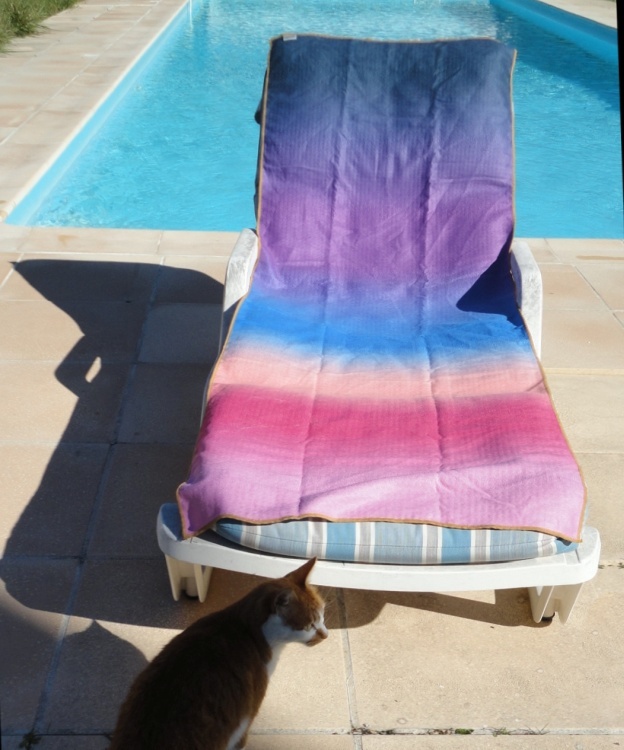 I also love to use it as a sunbathing towel as it entirely covers my lounger cushion and stays in place easily without slipping. Its shape and size seem made for the purpose and it looks fabulous by the pool. Good quality and quite absorbent after a few washes. Microfibre towels are a wonderful innovation and, having tried a few, I now use them exclusively after swimming and showering. They are super absorbent, weigh next to nothing, wash well, dry very fast and fold down to a ridiculously small size, if you want to take them with you. 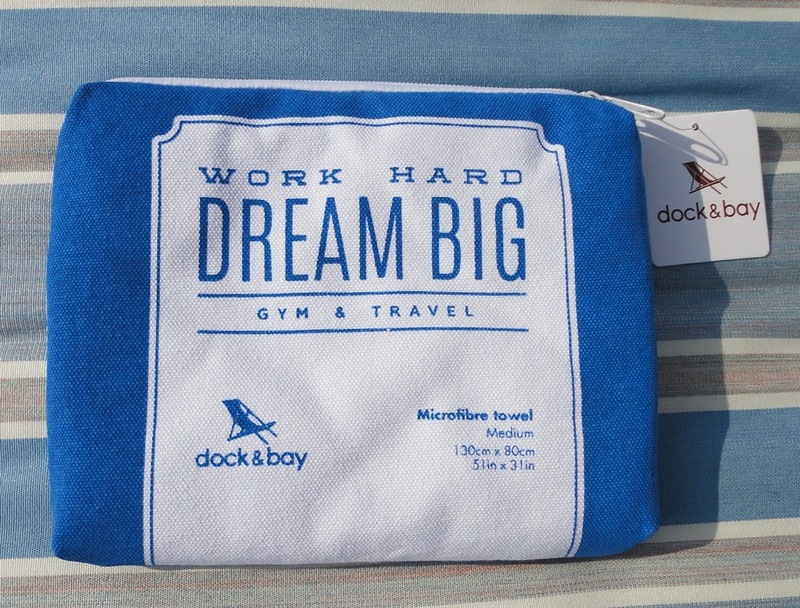 Ideal as a yoga towel, for the gym or swimming pool bag and, especially, for travelling. In my pool bag, this towel takes up almost no space and adds a fraction of the weight of my regular towels. The feel is like the softest chamois and it may take a little getting used to. I like to pat myself dry, as opposed to scrubbing with it. The towel I was sent is a very useful size (160 x 80 cm or 63 x 31 inches) for yoga, as a drying towel and to sit on at the beach, but there is a larger size for sunbathing that will fully cover a suntanning bed. In use the towel is amazing. I dried myself after emerging, dripping wet, from the water. Draped over the back of a chair in the sun, half an hour later it was dry! Great for pulling moisture out of your hair if you have long hair like me, and wrapped around my head, this towel really sticks to itself and doesn't fall off. With some care it should last well. Key washing points: cool water (30°C), delicate cycle, and air drying (no tumble drier). Also, according to my research: avoid adding conditioner (it diminishes its gripping action and absorbing power); do not add to a mixed load (lint is picked up from other fabrics); and use as little detergent as possible, especially if the towel is not really oily or dirty. The thing with microfibre is to keep the air spaces open and avoid anything that could cause clogging. Personally, I always hand-wash the first time, to disperse excess dye, and thereafter use the delicate cycle and wash with similar fabrics. Visually, these towels are gorgeous. 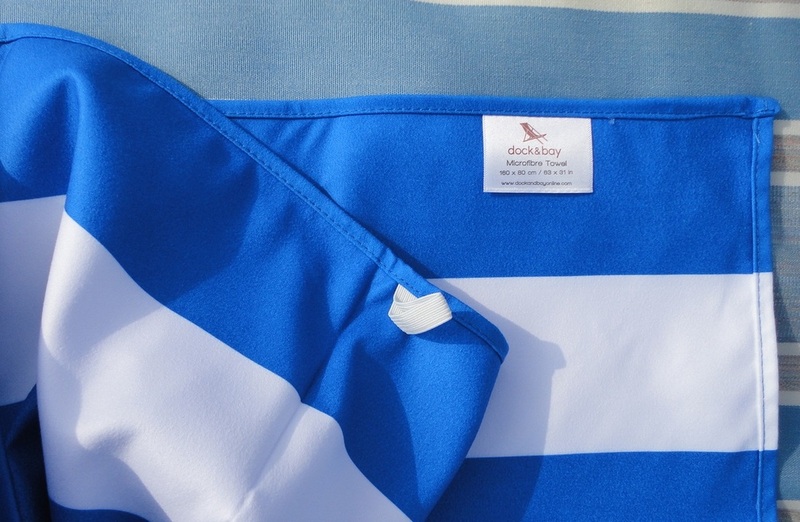 There are six vibrantly coloured striped choices available, and three solid colours that match the stripes, all with a pretty embroidered logo in a corner. Stitching is neatly done and there is an elastic loop to hang it from. 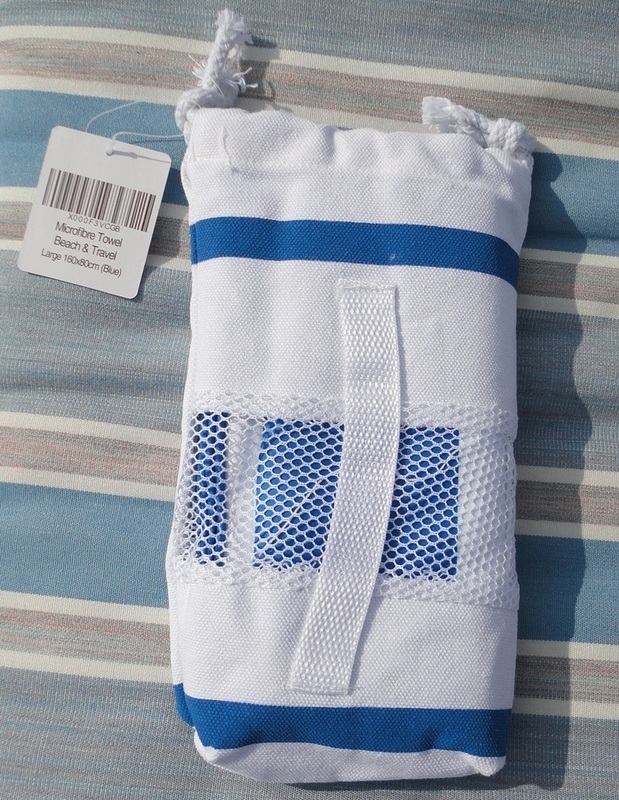 The storage bag is also beautiful, soft canvas with a carrying handle and a mesh insert to let the towel dry even when it's folded and packed away. 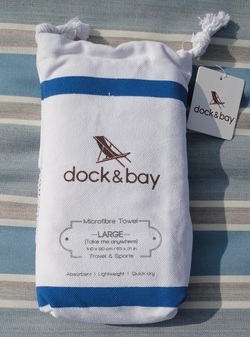 I love the unique feel of microfibre towels and now use them exclusively after swimming and showering. They are super absorbent, weigh next to nothing, wash easily, air-dry really fast and, if you want to take them with you, can be folded to a ridiculously small size. 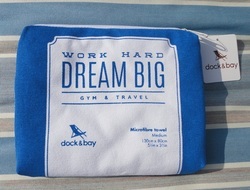 Ideal for the gym or swimming pool bag and, especially, as a travel towel. 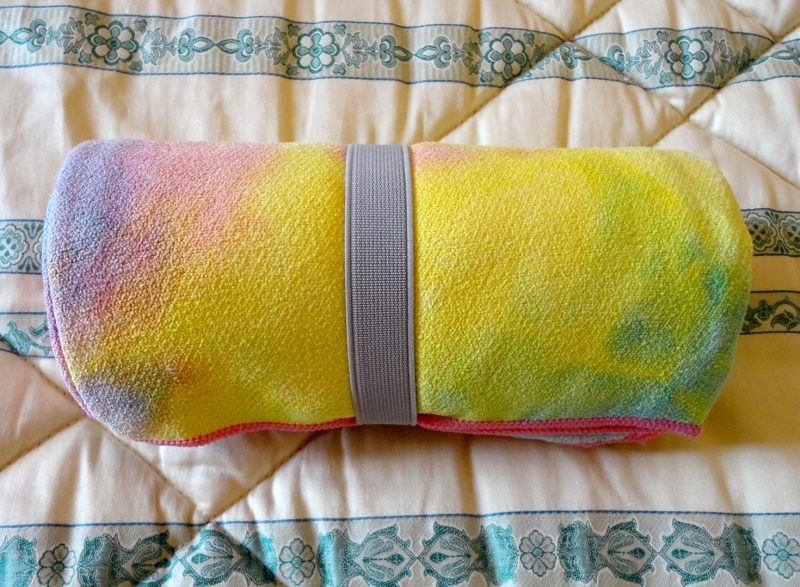 In my pool bag, this towel takes up almost no space and adds a fraction of the weight of my regular towels. 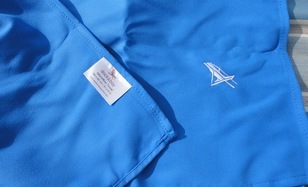 The fabric is smooth like the softest chamois and it takes a little getting used to the feel on the skin. I tend to pat myself dry, as opposed to scrubbing with it. 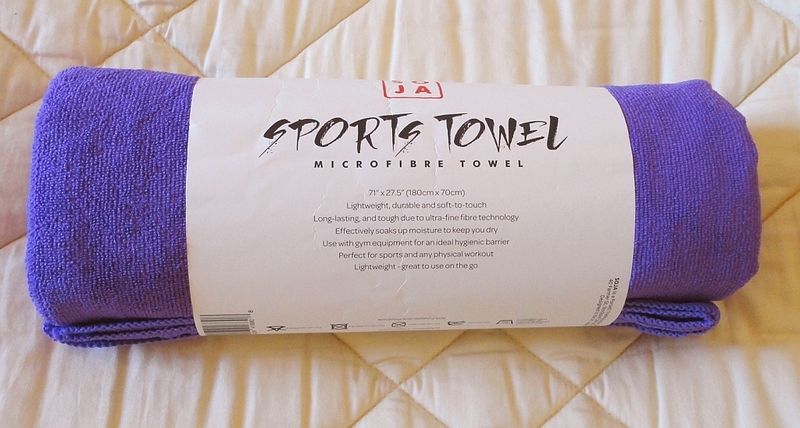 The sample I was sent (130 x 80 cm or 51 x 31 inches) is a perfect size to use as a drying towel for your gym or pool bag, for travelling and camping, but there are larger sizes for yoga and for the beach, and the largest one will fully cover a suntanning bed. In use the towel is amazing. I dried myself after emerging, dripping wet, from the pool. Draped over the back of a chair in the sun, half an hour later it was completely dry! Great for pulling moisture out of long hair; wrapped around my head, this towel really sticks to itself and, since it's so light, doesn't fall off. With some care it should last well. Key washing points: cool water (30°C), delicate cycle, and air drying (no tumble drier). Also, according to my research: avoid adding conditioner (it diminishes its gripping action and absorbing power); do not add to a mixed load (lint is picked up from natural fabrics like cotton); and use as little detergent as possible, especially if the towel is not very dirty. The main thing with microfibre is to keep the air spaces open and avoid any clogging. Personally, I always hand-wash the first time, to remove excess dye, and thereafter, I use the delicate cycle and wash with similar fabrics. Visually, these towels are gorgeous. They are available in three vibrantly coloured, saturated shades that match the striped ones, all with a pretty embroidered logo in a corner. 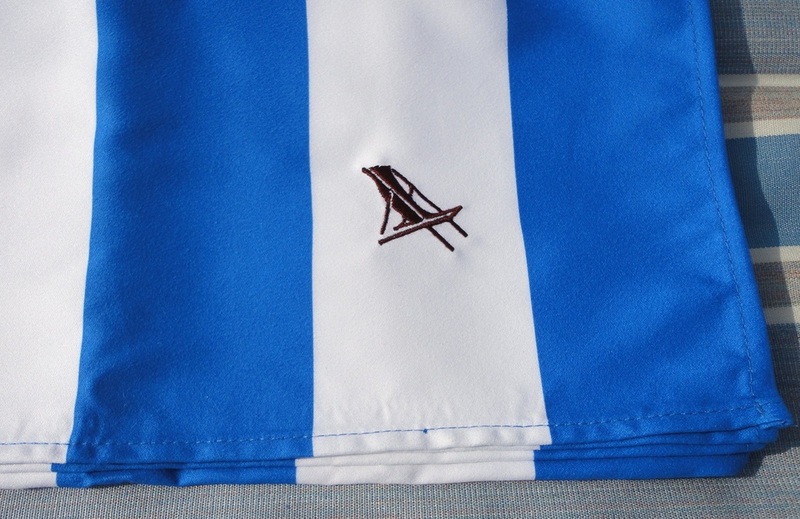 Stitching is neatly done and there is an elastic loop to hang it from. They come complete with a beautiful storage bag made of soft canvas with a mesh insert that lets the towel dry even when it's folded and packed away. 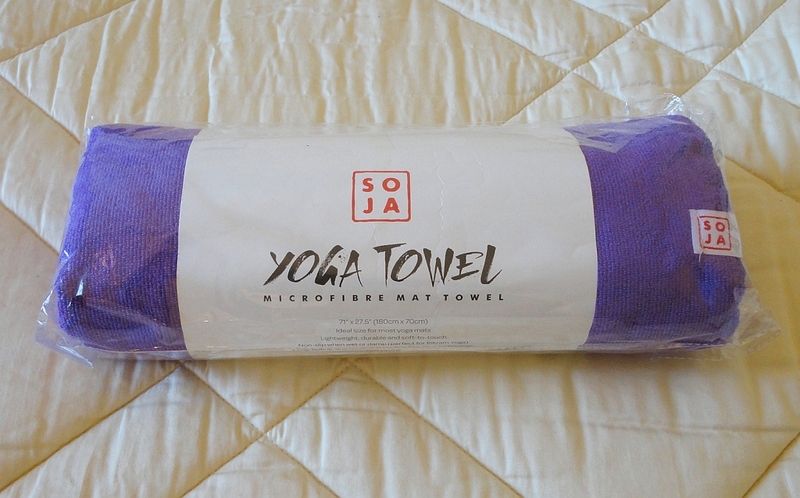 A lovely yoga towel in a luxurious shade of deep purple and long enough for my whole 5'8” frame! When I accepted this new product for an objective evaluation and review, I expected a somewhat coarse texture, going by the photos. 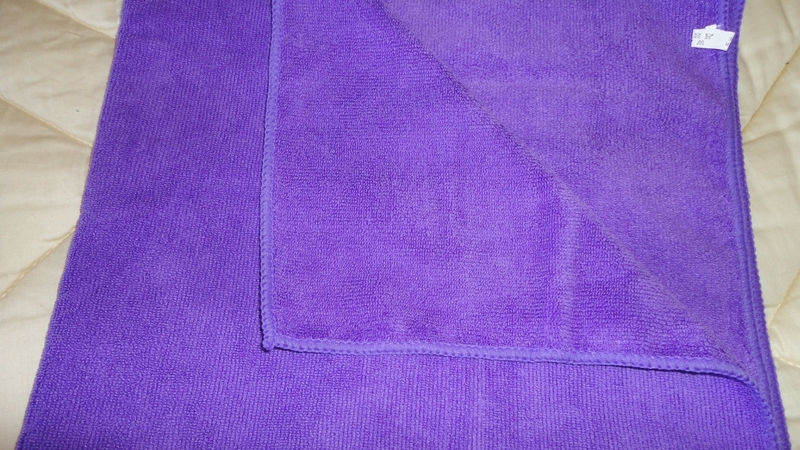 The towel is actually very soft and fairly thick for a microfibre item, it has a medium pile similar to a conventional cotton one, but with the advantage of being very absorbent. It is described as a yoga towel and it's certainly perfect for that function. It stretches nicely over my foam pad and actually overlaps it. I find it stable enough for my purposes, always keeping in mind that a fabric layer is not stuck down and so it's apt to move a little. The main thing is that it insulates my body from the ground and makes my foam pad even more comfortable. I can't say that I ever work up a sweat doing yoga, but the super-absorbency is very noticeable when I use it to dry myself after a shower. 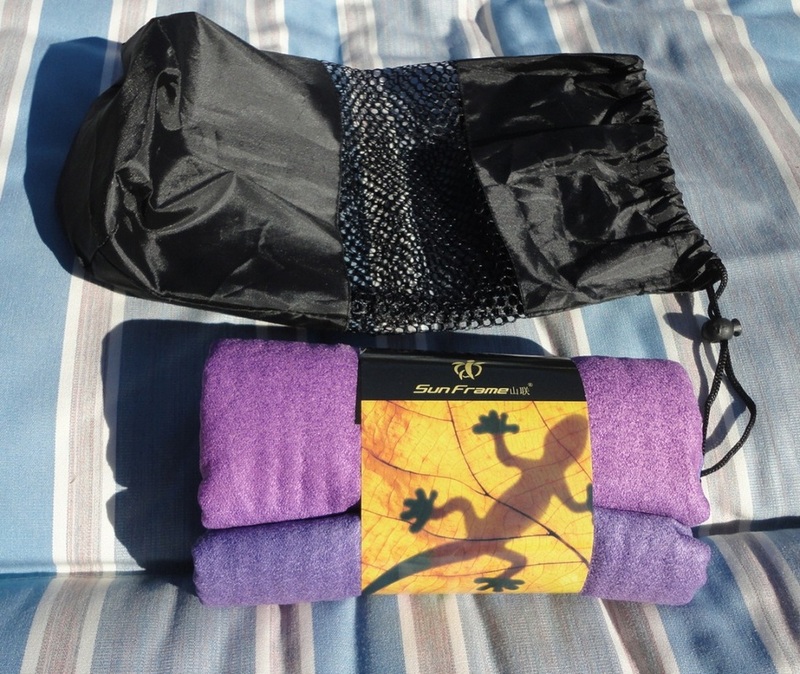 Rolled up in a fairly small bundle, it weighs much less than traditional towels and wicks better. It also dries faster, so it's a welcome addition to my pool bag. Use as little detergent as possible - some sources advise using only warm water, especially if the towel is not really oily or dirty. The thing with Microfibre is to keep the air spaces open and avoid anything that could cause clogging. 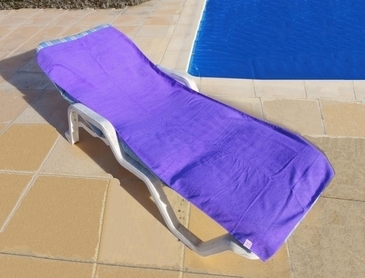 I also love to use it as a sunbathing towel as it entirely covers my lounger cushion but without loads of extra folds draping down the sides. Its shape and size seem made for the purpose and it looks fabulous by the pool. 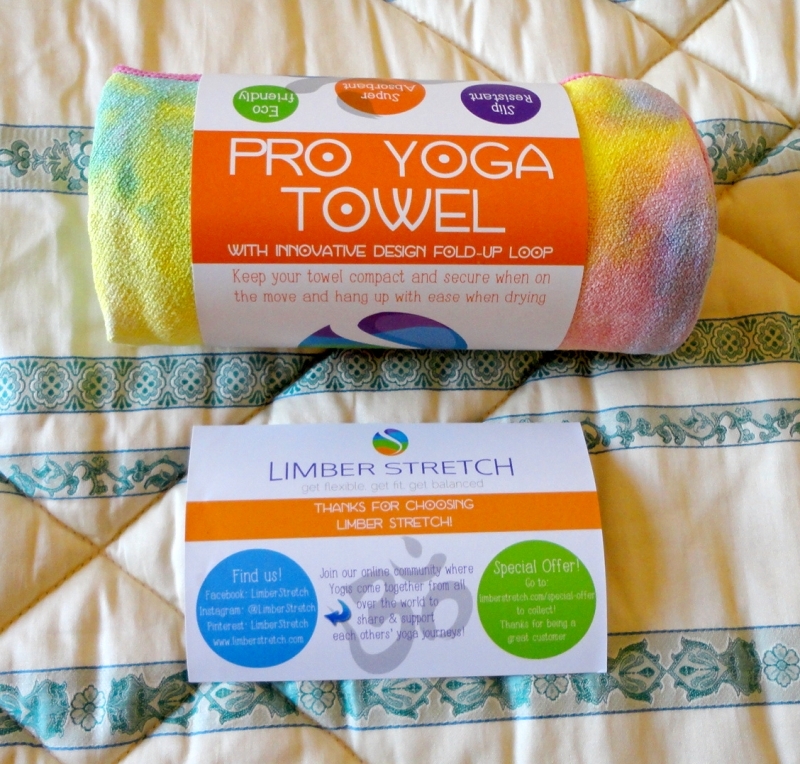 An excellent and well priced yoga (or bath) towel. 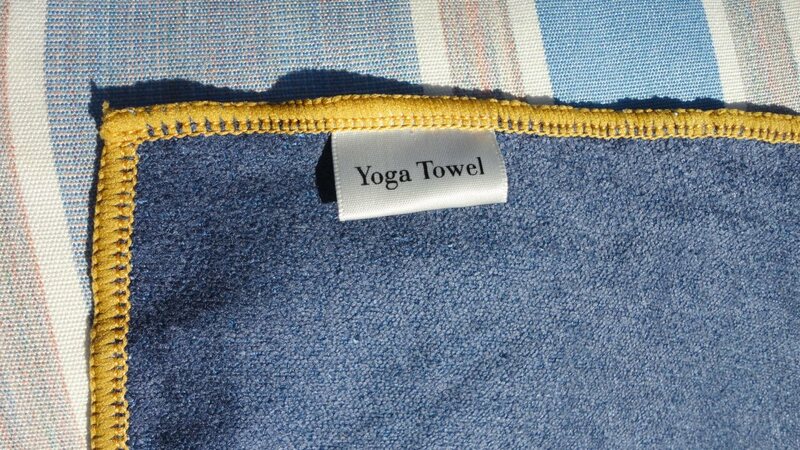 Bought at a discount during a promotional drive, this yoga towel has exceeded my expectations. It comes all rolled up in a neat little bundle with an elastic band to hold it together. The strong elastic loop is sewn in such a way that it always lies flat over the rolled-up fabric and, once the towel is open, you can use it to secure the towel on a hook (a high one, though). I love how long this towel is. I can stretch my 5'8” frame on it and be fully isolated from the floor. 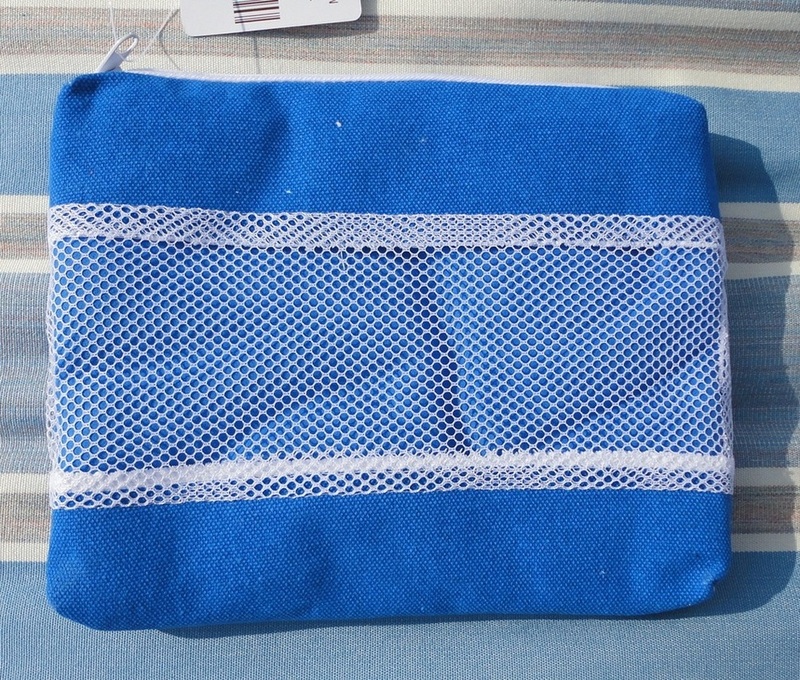 It comes all rolled up in a neat little bundle with an elastic band to hold it together. 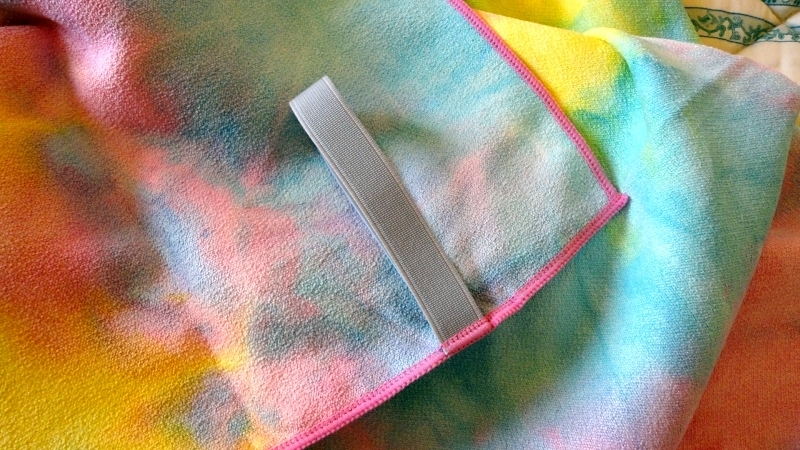 The strong elastic loop is sewn in such a way that it always lies flat over the rolled-up fabric and, once the towel is open, you can use it to secure the towel on a hook (it would have to be a high one, though). I love how long this towel is. I can stretch my 5'8” frame on it and be fully isolated from the floor. to use as little detergent as possible - some sources advise using only warm water, especially if the towel is not really oily or dirty. The thing with Microfibre is to keep the air spaces open and avoid anything that could cause clogging. 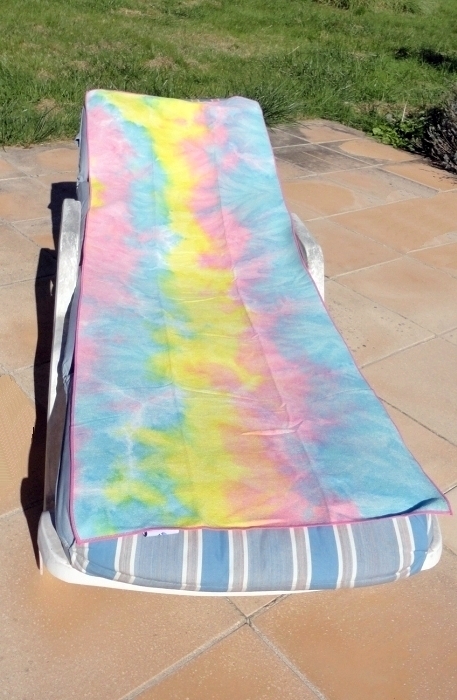 This towel is also great for sunbathing. 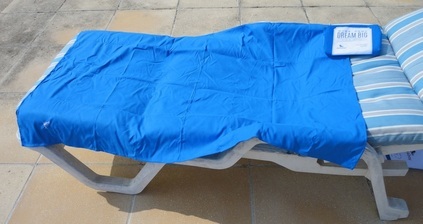 It completely covers my lounger cushion and looks fantastic by the pool. It comes in some lovely, strong colours but, when I saw the tie-dye one (full name: Psychedelic Days), I knew which one I really wanted! It's a mix of fresh, sorbet-like shades of sky blue, lemon yellow and light pink, with hints of violet and light green where the main hues overlap. It's so pretty and functional, and it gives me pleasure to look at it. Easily the best yoga towel I've ever had.